Michael is a guy who NEEDS variety in his food life! Unfortunately for him...I errr...don't. And I have a difficult time thinking outside of my chicken/potato box oftentimes. Which is why I was THRILLED when I was forced into some creativity by Hillshire Farms when they asked me to make a recipe using their Smoked Sausage. And...wow...it could not have been simpler! Hillshire Farms Smoked Sausage requires like...no effort. You just take it out of the package and it is ready to be used! Whether you decide to throw it in a pasta sauce, make a chili or stew, put it on a pizza, etc! The options are endless and kind of crazy easy! For more recipe ideas check out the Sausage So Simple tumblr! 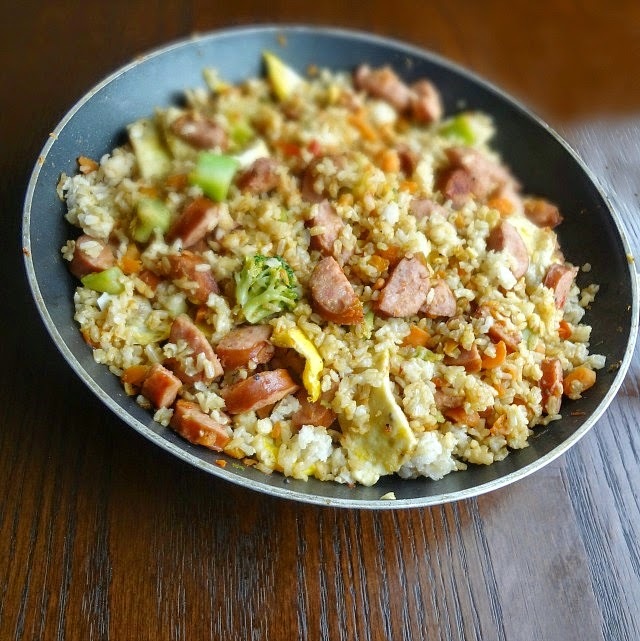 Now, I decided to make some fried rice with the smoked sausage because Michael loves Asian food and I never make it, so this was a double opportunity for changing stuff up! And it took me no time to make, which means it is the perfect weeknight dinner option! 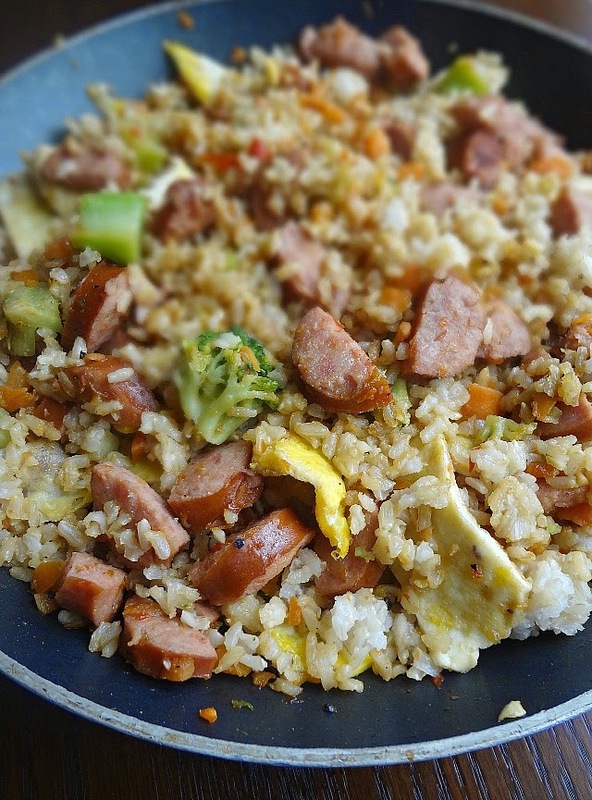 The first person who tried this fried rice was my brother and he immediately texted me how good it was! He really loved the flavor the sausage added (which makes sense since Hillshire Farms experts have perfected the pre-seasoning of their sausage over the last 75 years!!) and the fact that it was the perfect post-workout meal (*shrug* he's pretty health conscious these days). And he hoped Michael wouldn't like it so he could have more, hehe. Michael DID like it (a lot), but we were nice and let Josh have some more also. Because when you have the option of making such a quick and perfect dinner...there's no reason not to share! Cut sausage into half inch slices, and then cut each of those in half. Spray a large skillet (or wok) with nonstick cooking spray and heat over medium heat. Add beaten eggs to the pan. Cook-without stirring-until the eggs are set and cooked through (2 minutes or so). Use a spatula to remove the eggs and slide onto a plate. Cut into short, thin, strips. Set aside and keep warm, if possible. Heat the 2 tbsp. of cooking oil in the skillet you just used over medium-high heat until hot. Add cooked rice and stir occasionally until the rice is slightly crisp (about 5-9 minutes). Remove from pan and keep warm, if possible. Add sausage, broccoli, carrots, bell pepper, garlic, and black pepper to the pan on medium heat. Cook, tossing/stirring constantly, until the vegetables are tender but still crisp (not all mushy)-about 7-9 minutes. 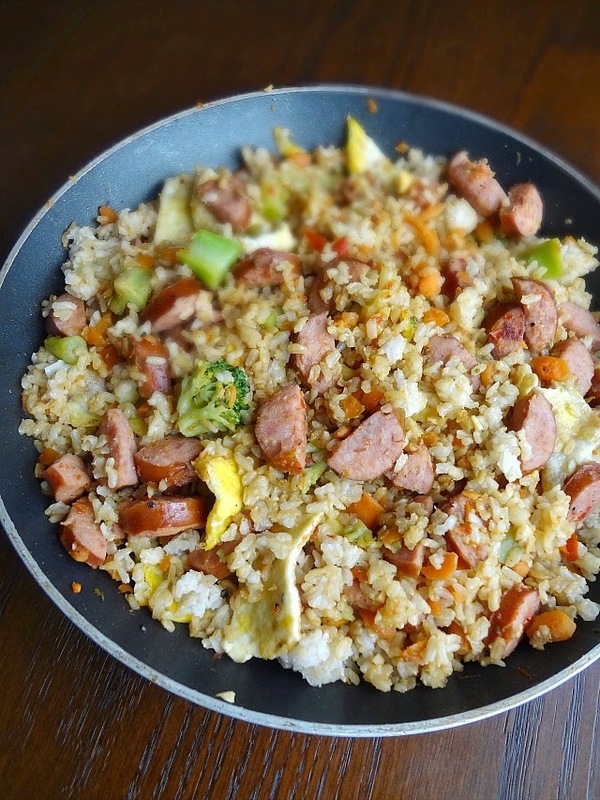 Add cooked egg, rice, and soy sauce to the vegetables and sausage. Stir until combined and completely heated through. Store any leftovers in an airtight container in the refrigerator for up to 5 days. #spon: I'm required to disclose a relationship between our site and Hillshire. This could include Hillshire providing us w/content, product, access or other forms of payment.